Ventriloquism has been very good to us for now nearly a half century. Many ventriloquists have inspired, influenced, and aided my personal career as well as our Maher Ventriloquist Studios years. This project in our retirement will hopefully express, in a small way, our appreciation. 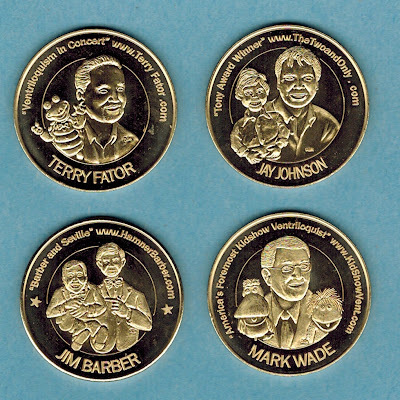 All funds (100%) received from the sale of these Hall of Fame coins will be used entirely and specifically for the purchase of future additional sets. Thank you for your help and support through the purchase of coins and by spreading word of this project. Big, bright and beautiful golden bronze coins, 34 mm in diameter (see quarter in photo for size comparison). Classic artistry of David J Miller, exquisitely engraved by master artisans. You will own, show, collect, display and gift these unique and rare coins proudly. A total of 48 Hall of Fame Coins is planned, limited to 200 sets per series. Satisfaction 100% Guaranteed! "I received the coins and I can't tell you how pleased I am with them. Your decision to use a modeling die style made all the difference in these beautiful coins. 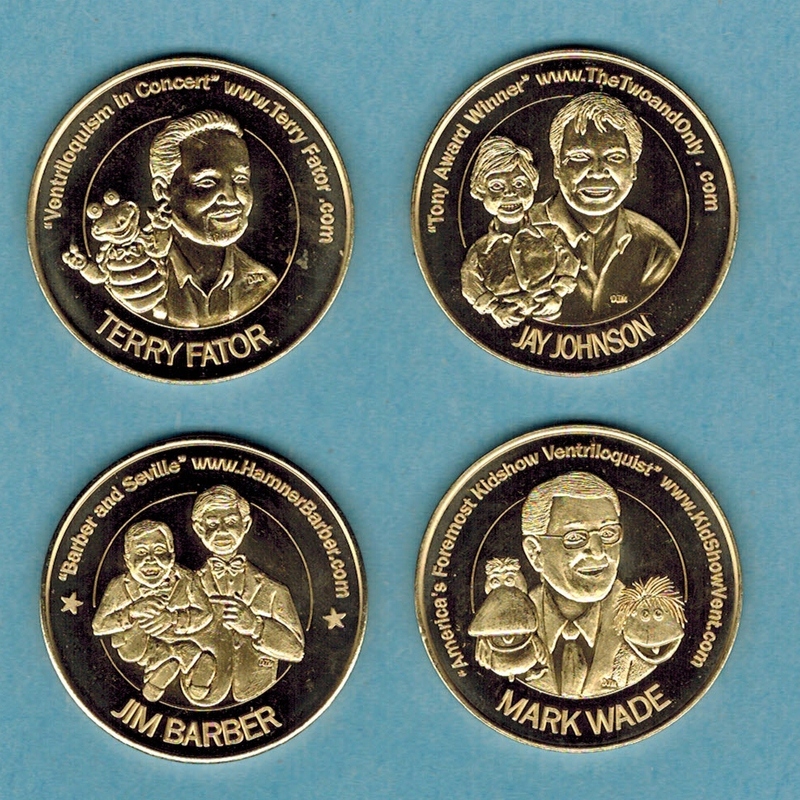 "I am very impressed with the OSBORNE COIN PRODUCTIONS workmanship. "They took my designs and improved them to show such things as teeth (look at Farfel and Fred Maher), slot jaws on the figures (to show they are Dummies), lines to show hair lines on the heads, the detail in the glasses (see the Fred Maher coin), even the little rose on Charlie's lapel, and the knuckles on Skinny Dugans hand and much, much more. "The coins are superb and have wonderful depth and dimension. "I am very proud that you let me play a small part in this project and in your dream."